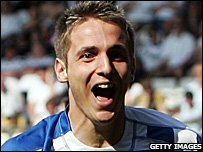 Reading striker Kevin Doyle has been named the Championship player of the month for September. He scored five goals in as many league games beginning his scoring run with a second hat-trick of the season in the 6-0 win against Sheffield Wednesday. The 25-year-old Republic of Ireland international is the top scorer in the division with eight goals. Also shortlisted were Joey Gudjonsson of Burnley, Martin Albrechtsen of Derby County and Wolves' Michael Kightly.